October 26, 2015 – In one image from a million miles away, NASA’s EPIC Camera captured three developing tropical low pressure areas in the Indian Ocean. Two of the three systems have a medium chance to develop into a tropical depression in the next day or two. On October 25 and 26 two tropical low pressure areas are spinning in the Northern Indian Ocean, and one in the Southern Indian Ocean. The Earth Polychromatic Imaging Camera or EPIC instrument that flies aboard NOAA’s DSCOVR or Deep Space Climate Observatory satellite captured an image showing all three low pressure areas on October 25 at 05:37 UTC (10:37 a.m. MDT). The DSCOVR spacecraft is located at the Earth-Sun Lagrange-1 (L-1) point giving EPIC a unique angular perspective that will be used in science applications to measure ozone, aerosols, cloud reflectivity, cloud height, vegetation properties, and UV radiation estimates at Earth’s surface. DSCOVR orbits about 1 million miles from Earth. 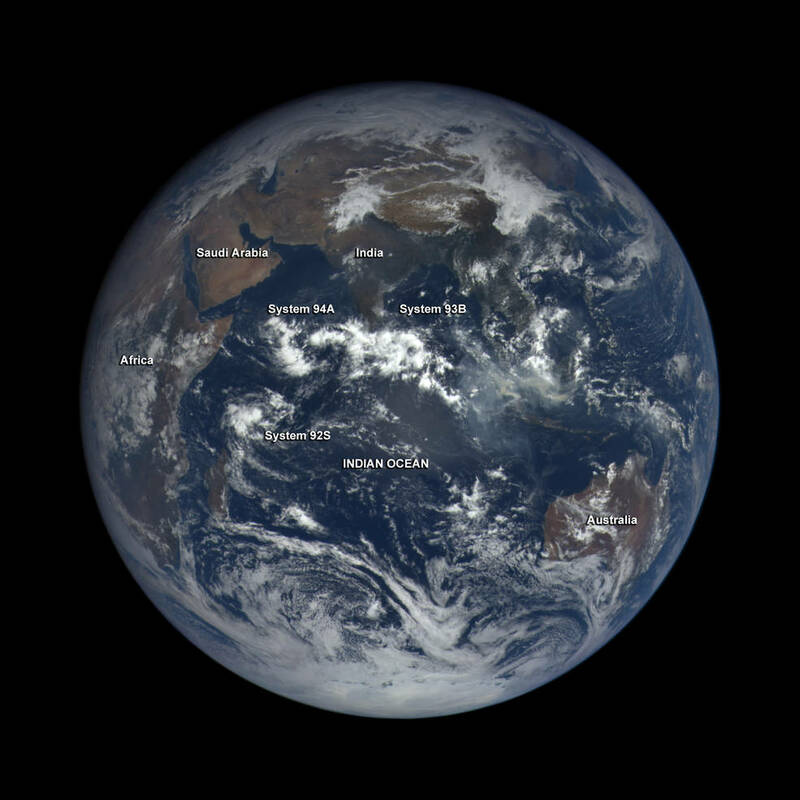 In the Northern Indian Ocean System 93B was located east of the southern India peninsula. System 93B was near 6.6 degrees north latitude and 83.1 degrees east longitude. That’s about 190 nautical miles east of Colombo, Sri Lanka. Despite this low pressure area having a weak low-level center of circulation with disorganized convection (rising air that forms the thunderstorms that make up a tropical cyclone), it is in an environment with low to moderate vertical wind shear. However, because it is close to Sri Lanka, its proximity to land is hindering development. System 93B has a low chance for development in the next two days. On the western side of the southern India peninsula was System 94A. System 94A was centered near 7.0 degrees north latitude and 66.0 degrees east longitude, about 1,080 nautical miles south-southeast of Muscat, Oman. System 94A has fragmented bands of thunderstorms wrapping into an elongated low-level center of circulation, but it’s in an environment with warm sea surface temperatures and low vertical wind shear that will allow it to develop. In the Southern Indian Ocean, low pressure area designated System 92S was centered near 7.0 degrees south latitude and 54.2 degrees east longitude. That’s about 830 nautical miles north-northeast of Antananarivo, Madagascar. The EPIC image shows that this is a large system and it appears somewhat elongated. Maximum sustained surface winds in System 92S are estimated at 25 to 30 knots (28.7 to 34.5 mph/46.3 to 55.5 kph) . Minimum sea level pressure is estimated to be near 1004 millibars. System 94A in the Northern Indian Ocean and System 92S in the Southern Indian Ocean both have a medium chance to become a tropical depression over the next several days.